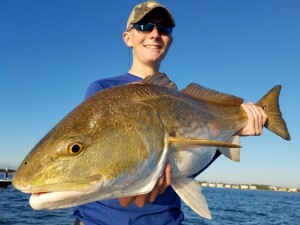 After a brief discussion on what to look for and how to go about catching the Bull Redfish we were off. 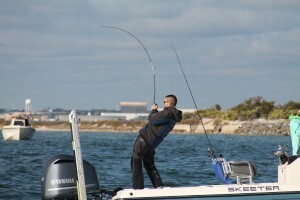 Part of that discussion with clients always includes DO NOT set the hook like you’re Bass fishing. Well……. as you can see from the pic Randy violated that rule on the very first cast! Randy, Robin, Laker and Oakley smashed the big ol Redfish from shortly after the trip started until everyone’s arms felt like noodles 6hrs later. It’s always an honor to spend the day on the water with such a great ambassador for the sport of fishing. A humble Champion with a great family. To many amazing pics to post from this trip. Spring Break is just around the corner and the calendar is filling up fast. If you would like to book a trip give us a call or stop in at Grays Tackle to book your trip.